Saikano is what seems to be a tragic love story falls short in successfully invoking deep emotional reactions from the viewer as the story seems too linear and the characters are not fully developed. I wanted this anime to really invoke the feelings of pain and despair from the story of two lovers that keep hurting each other, but in the end, it was nothing more than a sad story. The anime starts of with Shuuji and Chise as a new couple and they start to exchange a diary awkwardly. Everything seems so peaceful but suddenly Sapporo gets bombed and Shuuji discovers that Chise is an ultimate weapon. Of course, this is because of a war that is happening around the country. What war? No idea at all. The anime did not give a single piece of information regarding what the war was about, who were the people fighting against, why was Chise turned into a weapon, and the list goes on. I have not seen an anime that had this many plot holes in the story. Well, with pretty much no back story or information to go on, I had to tediously sit through episodes of constant conflict between Shuuji and Chise as they try to make ends meet. In the end, I would say that the effectiveness of this anime to make me cry would be close to null. Sure enough it was a sad story, but the execution of the plot with the characters was generally poor indeed. This anime was actually aired a decade ago, so art quality was not particularly great. Even so, the characters looked a bit out of proportion and they had little detail on them. I would say that the background and scenery was somewhat of acceptable quality, but the animation was really disappointing. Some animation was rather jumpy and felt a bit too unrealistic to be overlooked as natural human error. The theme song were pretty bland and really average for anyone to enjoy. Voice acting was somewhat unnatural to the characters they represented and many times it felt that the dialogue and the scene did not match properly. The anime did a fine job in leaving me in the dark as to who and what Chise is. Many questions are left unanswered and the anime makes no effort in explaining the background of each and every character in the anime. Thus, I felt no connection to Shuuji and Chise except that one is an ultimate weapon and the other is a indecisive loser. In the end, pretty much everyone dies and Shuuji is left alone with only Chise in his thoughts and heart. I would say that the story was full of holes, quite linear, predictable and really ambiguous about everything. As a result, I felt no connection to the characters at all and felt no pity for the deaths of most of them. The anime felt a bit rushed and was not refined properly. So, if you are desperate in finding some tragic love story to watch, then this might fill up your spare time. Otherwise, if you really want to cry, there are plenty of other alternatives available. The story was full of holes and left out many details. Somewhat rather average and low quality. Voice acting was mediocre and theme songs were really bland to listen to. The anime did not explain an detail about the characters so I felt no connection with them. 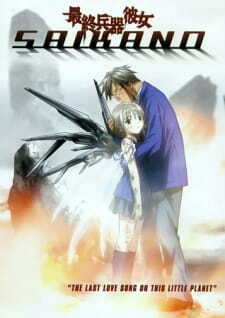 I watched this anime wanting to be emotionally moved, but no, it was just a loose sad story that really didn't take off. Would I recommend this anime to anyone? Probably not. I question some script choices and decisions made in this anime. Overall, it was pretty disappointing.